Fire. Water. Earth. Wind. These four elements have driven mankind’s mythology, philosophy and science for thousands of years. Now master these primal forces in this easy-to-learn but deeply strategic game. Element, the latest release from the creative minds at Rather Dashing Games, is a unique strategy game for 2 to 4 players, ages 14 and up. 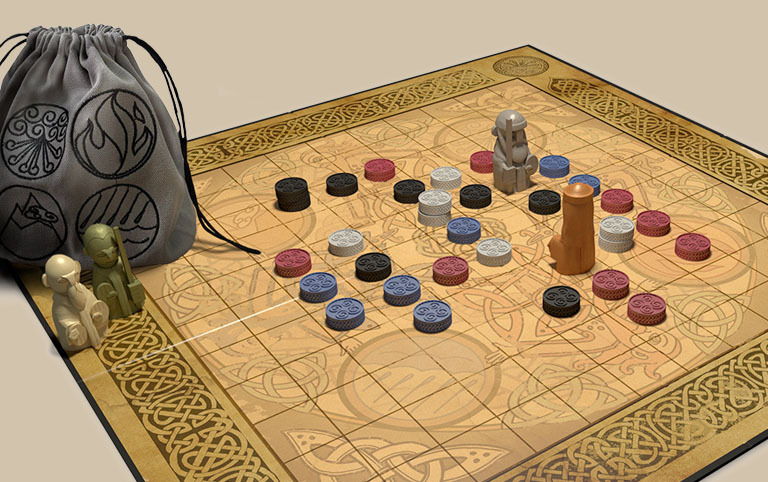 Players take turns drawing and placing element stones to encircle their opponents’ sages (player pieces). Each element has unique properties used to block an opponent’s movement. Feed walls of flame, move raging rivers, raise impenetrable mountain ranges and even bend wind to your command. Transform one element into another with the rule of replacement or sacrifice stones to help your sage avoid capture. Understanding the subtle, diverse and powerful nature of the four elements is the key to surrounding your opponent and claiming victory. Interactions between the four elements and the sages ensure that the game never plays the same way twice. Element’s rich gaming experience makes it perfect for tournaments and organized play. Element joins Rather Dashing Games’ already stellar catalog of easy-to-play, hard-to-win games including We Come in Peace, the Drawn & Quartered series – Pirates, Ninjas, Robots & Zombies and Graveyards, Ghosts & Haunted Houses – and other favorites such as Four Taverns and Dwarven Miner. For more information, please contact Jeanne Sidner at jsidner@kalmbach.com. To see a full listing of Rather Dashing Games, please visit www.ratherdashinggames.com.